The G5 is one of the most impressive howitzers ever deployed in the world. It was first deployed in the late 1970s after a short development process in which Canadian maverick designer Gerald Bull played an important part. 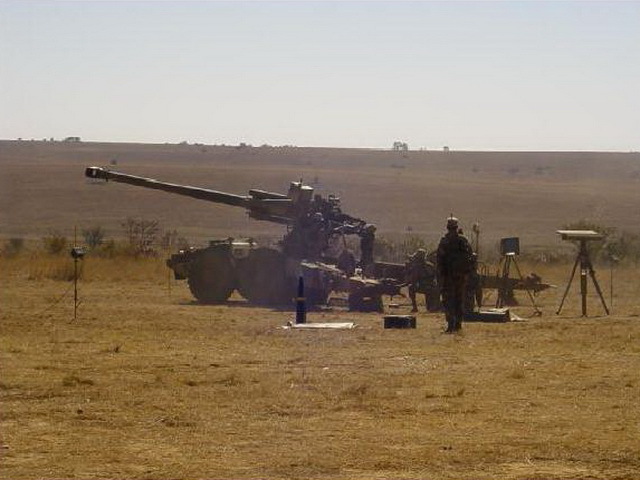 The gun was developed as an answer to the relative long ranges of Soviet artillery encountered by the South African Army during Operation Savannah in 1975, although initial development started in 1969, and for which the South Africans had no counter until the advent of the G5. The basic gun as was initially fielded was designed with extreme range and accuracy in mind. To this end the gun has a large firing chamber to accommodate the large charges required to hurl a normal shell 30 000 meters. Another factor which plays an important role in the long range is the relative long calibre, 45 calibre initially and 52 calibre at present, of the barrel making the barrel very long. Despite this length the gun is still air transportable in a C 160 Transall. The last factor is the use of the unique base bleed round which improves the ballistic characteristics of a normal shell by burning power around the base of the shell to reduce wave and base drag. The use of this shell increased the range of the gun to 39 000 meters although new technology has increased the range to an astonishing 75 000 meters. The basic range is even today sufficient to out distance any gun in the world. Other interesting design features of the gun are the provision of a semi automatic closing breach and shell rammer to assist the crew in the loading of the gun at any elevation. Despite this South African gunners rarely made use of this feature preferring to use muscle power to ram the 45 kg shells into the breach. Another interesting feature is the provision of a on board engine which provides the gun with a limit amount of self propulsion, up to 16 km/h on a hard surface, an makes it very easy to position the gun in firing positions. The last time saving feature of the gun is the provision of self digging spades and motorised trail wheels which allows for rapid deployment of the gun and makes the firing in of the gun unnecessary. The only draw back of the gun is its relative low rate of fire and low amount of shells the gun is capable of firing during sustained use. This problem let to a catastrophe during operation Modular when a gun suffered a “cook off” resulting in the destruction of the gun and seriously wounding the crew. Although the gun was deployed during the late 1970s the first time the gun saw combat was during Operation Alpha Centuari in support of Unita. During this operation the long range and accuracy of the gun was proved to be a great force multiplier. This fact was further borne out during Operations Modular, Hooper and Packer were the guns effectively pinned down the advancing Angolan brigades and later was instrumental in closing the Cuito air base. The gun became a big thorn in the side of Fapla and the Angolans spent a considerable amount of effort in trying to destroy the guns, something which they never achieved. Which makes the achievements of the G5 even more astonishing is the fact that there was never more than two batteries deployed, a total of 16 guns, deployed in the theatre. As with the G6 the G5 has been continually updated and now has a 52 calibre barrel and can fire a large range of extreme long range shells. Despite these updates the gun still has a relative low amount of shells it can fire sustained which in some way explains the relative low export success of the system. The South African Army however expects to field the gun, as with the G6, for a very long time into the foreseeable future.